What a difference four years make. At around this time back in 2010, New York City and its transit system was gearing up for a day of reckoning. Bus lines throughout the city were to be axed with more bus stops eliminated, and subway service was set to be pared down. Despite record ridership, the MTA’s finances were in disarray, and Albany wasn’t willing to take unpopular steps to shore up the balance sheet. These days, the MTA’s finances aren’t any more secure than they were four years ago, but the economy on the whole — and key tax revenues — are on the up and up. Thus, the agency is on a better footing and can bring service increases online to meet demand. We heard last week about some major increases in off-peak L train frequency, and that won’t be, according to a report in the Daily News, the only transit bumps New Yorkers will witness this year. We’ll know more once the MTA’s budget is released in July, but as Pete Donohue reported, the MTA is gearing up to add $20 million worth of service. The presidents of the MTA’s bus, subway and commuter train operations have submitted to headquarters possible targets for funding. Some board members and advocacy groups, like the Straphangers Campaign and the Riders Alliance, also have pitched suggestions. They include extending the J train on weekends to Broad St., extending the B37 bus route to downtown Brooklyn, returning the M104 to 42nd St., restoring weekend service on the Long Island Rail Road’s West Hampton branch and extending Metro-North Railroad trains with additional cars to reduce crowding. The MTA executive, speaking on condition of anonymity, said the authority will not restore all of the 2010 cuts, adding that they included bus routes that proved too expensive because of extremely low ridership. This new round also will likely include more nonservice initiatives, such as working to improve cleanliness and customer communications, the executive said. Based on this list, I’m more intrigued by the cleanliness and customer communications initiatives than I am of the actual service increases. Longer Metro-North train sets at certain hours of the day would be a boon for riders who feel the space limitations, but extending the J train to Broad St. on weekends isn’t anything that impacts that many subway riders. I’m hoping for more once we see the final plans. I am also tempted to say that it doesn’t make sense to bring back many of the axed bus routes, but this position raises the question of induced demand. Can bus service — even those expensive to run — lead to a greater desire for transit service? Still, investment in more transit service is a positive from the MTA. We saw them pare down service by nearly $100 million a few years ago, and they’ve slowly added it back where demand warrants it. These are moves that warrant support; it’s only too bad the investments come in such small increments. Imagine where we would be and how the transit network could serve the city and the region if money were less of an obstacle. While the right way to spend $40 million may be in doubt, the MTA is forging ahead with a plan to use of this unexpected windfall to restore services. According to a report in the Daily News and documents that will soon be made public, the agency will devote at least $14 million to bringing back some bus and subway service lost to 2010 rollbacks. It’s unclear right now what the so-called “subway improvements” will be, but Donohue notes that at least $700,000 in G train upgrades, spurred on by the results of the full line review, will likely be a part of the budget as well. We’ll know more next week, and as it’s late and I just made it home from the All Star Game, I’ll have more to say later on Wednesday. A few weeks ago, during the June MTA Board Meeting, authority officials let slip the word that they were considering some service restorations. With a rosier financial outlook, the MTA estimated that it could bring back around $20 million of cut subway and bus services, good news indeed for New Yorkers used to cuts. Now, with the July meeting on tap, a new report says that the MTA will unveil those service restorations next week, and, as an added bonus, Transit will commit to making the G train extension through Brooklyn permanent. Transit officials are poised to allocate tens of millions of dollars for additional bus, subway and commuter train service — and plan to make permanent a popular expansion of the G train in Brooklyn, sources said.Metropolitan Transportation Authority executives have been drafting and revising lists of rider-friendly initiatives that include restoring some — but certainly not all — of the service that was whacked in 2010 to close a canyon-like budget deficit, the sources said. Now, the authority’s finances have improved to the point that transit executives are confident they can ramp up service in parts of the system where planners and managers believe it is most needed and practical. A majority of the restorations will be in Brooklyn and the Bronx, which makes sense because those boroughs were hit the hardest by the bus-heavy budget cuts two years ago, the sources said. MTA Chairman Joseph Lhota and top transit executives will unveil the service upgrades as they present revised financial plans to the MTA board next week. Some of the dropped routes will be brought back to life — though one source said those will be few in number. In most cases, the MTA will run buses more frequently on certain routes to better meet increased demand, or extend an existing route into a neighborhood where buses don’t currently stop, that source said. It’s unclear right now how much money will be allocated toward the service restorations. Donohue says the MTA could have as much as $90 million on tap come the end of the year. It’s also unclear which services will be restored and when. Still, this is a welcome development indeed. Two years ago — to the day, if you’re reading this on Thursday — the MTA, in the face of a massive budget deficit, enacted sweeping service reductions that cut a deep gash through the city’s transit network. Although many believed the authority was playing chicken with Albany, the MTA called the state’s bluff in 2010 when, on June 28, it cut two subway lines, 36 bus routes and around 570 bus stops. Now, the agency may be reassessing these cuts as it prepares its 2013 budget, but the extent of any service restorations will remain contingent upon money and the reality on the ground. At the time of the cuts, Albany could do nothing. New York State had been struggling financially, and legislatures couldn’t or wouldn’t find new revenue to keep services up and running. In an effort to spread the pain, the MTA included service cuts in its sweeping economic reforms, and since that day two years ago, neighborhoods have been up in arms. The same state representatives who refused to confront the MTA and its problems head on have spent years arguing for the restoration of services. Cries have gone up from every corner of the city, from the M8 to the B77, from Sheepshead Bay to the Bronx. For years, MTA representatives have said services could be restored if the money materializes, and yesterday, the MTA Board made a similar pledge. According to Board members, up to $20 million in next year’s budget could go toward restoring lost services. I have to believe most of that will go toward brining back the buses, but I’m hopeful some could lead to increased subway service as well. There is no date. There is no proposal. And there is certainly no guarantee. But for the first time since 2010, when the Metropolitan Transportation Authority approved deep cuts amid a budget shortfall, there appears to be optimism that some of the services that were eliminated may be restored — provided that the agency’s recent, if tenuous, financial trends and ridership increases hold. “Not a day goes by when I don’t think about restoration of services and further investments in the system,” Joseph J. Lhota, chairman of the transportation authority, said Wednesday during a monthly board meeting at the agency’s headquarters in Midtown Manhattan. Mr. Lhota added that the authority remained in the “early stages of evaluation” for possible restorations. According to Flegenheimer’s report, many MTA Board members are also concerned that the looming fare hikes, guaranteed a few years back, will leave a very bad taste in people’s mouths without a corresponding bump in service. “It’s awfully hard to ask people to pay more when they’re getting a lot less,” Albert said. Of course, a pair of issues remain, and first between those is money. When asked about the dollars, former Gov. David Paterson, the newest addition to the MTA Board, hedged. “This is the problem,” he said. “Everybody could tell me what they didn’t want cut, but no one could tell me how we balance the budget.” It’s still the problem as New York politicians want service restored but have no plans to pay for it. The MTA will likely have to move some money around and hope for a recovering economy. The second problem though is a tougher one to overcome. 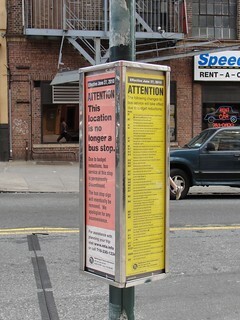 In the aftermath of the service cuts, NYC DOT, the party that controls the city’s bus stops, uprooted many of the then-defunct stops, including all of the shelters and poles along B71 just around the corner from my apartment. The CEMUSA shelters are gone; the bus stations are now parking spots. The MTA isn’t going to restore those services; we’ll never get many similar routes back. Still, it’s hard not to be optimistic here. Politicians have responded to their constituent demands, and the MTA is listening to those in positions of power who can exert some influence over the authority. By the time 2013 rolls around, we’ll likely have more service then than we do today, and that’s a net positive for the millions who need public transit in New York City. When I rode to work this morning, I found a seat waiting for me on my 3 train out of Grand Army Plaza and another on the 5 that greeted me at Nevins St. On a typical Monday morning, finding seats on both of those trains is a rarity, but today is not a typical Monday. Rather, it is Columbus Day, a loosely celebrated federal holiday during which some, but not all, New Yorkers have off. I noticed the subways were noticeably emptier this morning and so too did the MTA. Starting today, the authority has launched a pilot program that will see service reduced on the numbered IRT lines during minor holidays. Instead of operating trains on a weekend schedule as the TA does for Independence Day, Memorial Day and the like, Transit will instead run trains at around 75 percent of normal on Martin Luther King Day, Good Friday, Columbus Day, the Friday after Thanksgiving, Christmas Eve, the three weekdays following Christmas and New Year’s Eve if it falls on a weekday. Demand, says the authority, is usually 60 percent of normal during those so-called minor holidays. As far as the nitty gritty goes, peak hour wait times will increase by at most 1-2 minutes while off-peak wait times might be a bit longer, and the initial A Division-only pilot will save the authority $200,000. Transit anticipates “significant additional savings on an annual basis” when and if the program expands to include B Division lettered trains as well. On the other hand, though, the MTA says that “reduction in service is smaller than the reduction in ridership” on this minor weekday holidays, and anecdotally, the subways are often emptier during these holidays than they are on a typical weekday. So I pose this to you: Death by 1000 cuts or a service adjustment that makes sense considering the circumstances? To better align service along the 1 and 6 with load guidelines during the summer, the MTA has reduced service along those two lines, and boy, oh boy, is The Daily News unhappy about it. In a rather lengthy article, Pete Donohue reports that the authority has reduced peak service on the 6 from 23 trains per hour to 21 and off peak service from 15 to 13. Along the 1, Transit running 16 peak-hour trains, down from 18, and between nine and 11 off-peak hours down from 10-12. In other words, expect to wait 30 seconds more for the train. The MTA says that these adjustments are merely season as ridership slumps in the summer with school out and families head on vacation. “These are seasonal adjustments we’ve made based on declining ridership resulting from summer vacations and are similar to the seasonal adjustments we have been making along certain bus routes,” Transit said. “In most cases, customers would have to wait an extra 30 seconds for a train.” Still, that didn’t stop the News from finding irate customers along the IRT. “Whoever created the schedule should be forced to ride the 6 train all day,” rider Mary Dohnalek said in a letter, seemingly penned before service was scaled back, to Transit. I always find it tough to stomach any service scalebacks because it always seems to take longer to restore service, but a Transit spokesman assured me that full service would be restored when school starts again. “Both of these routes have very frequent service, so the customer impact is small and there are multiple benefits, including operating more cost-effectively, reducing our energy use, which has an added environmental benefit,” a Transit spokesperson said to The News. New York City recently passed an anniversary it would rather not commemorate for it was the one-year mark of the MTA’s service cuts. On June 28, 2010, as we all know, the MTA slashed two subway lines, rerouting another and cut numerous bus routes in order to cover a substantial budget gap. It was the first time in generations that the MTA had engaged in such extreme across-the-board cuts, and as many representatives in Albany today continue to fight over transit funding, those cuts serve as a real reminder of the power of the legislative pen. In the ensuing year, things have changed both on the periphery of transit in New York City and in the meaty center. Bus ridership has declined precipitously, and while slow boarding and sluggish surface traffic are certainly to blame, that New Yorkers must now wait longer for buses that aren’t as convenient is a major factor as well. Cut enough service and eventually, people stop showing up. On other hand, some have had luck in pressuring the MTA to restore service. Last week, facing a lawsuit and political pressure, the MTA revived the X37 and X38, express routes that served Southern Brooklyn. The replacement lines “didn’t really perform as we had anticipated,” an authority spokesperson said.“There was crowding, traffic delays, it was like a loading imbalance, where you’d have one bus that was too crowded and another that was almost empty.” Yet, I still yearn for the B71 as I’ve grown quite familiar with the 20-minute walk from Park Slope to Bar Great Harry on Smith St.
Pamela Golinski, an attorney who lives on the Upper East Side, used to ride an express bus to her office on Wall Street. After the MTA eliminated the line, she and a fellow rider tried to help a private operator run along the route. But the city shut that down, saying the operator didn’t have the necessary licenses. Now, she either rides a shared taxi that picks up at a stand near her apartment or pays a private van service. Lois Hecht is driving her 12-year-old Mercedes station wagon more often. Three back surgeries have made it nearly impossible for her to climb the stairs out of the subway. She used to take three buses to get from her home in Prospect Heights to Park Slope, Carroll Gardens or Manhattan to run errands and see movies. She and her husband moved to the neighborhood from the Upper East Side 5½ years ago in part because of the nearby buses. But many of them don’t exist anymore. This piece highlights those on the fringe, and it doesn’t paint a great portrait of the accessibility of the transit system. People who are too infirm to take the subway because of the stairs at every station used to rely on buses, but now those buses are gone. Access-A-Ride costs will go up in some cases, but in many others, these riders simply won’t take transit any longer. Still, the fight for funding continues, and every time a bus line is eliminated or rerouted, people lose out on options and convenience. That’s not a net positive for anyone in the city. During the MTA Board’s committee meetings this morning, New York City Transit unveiled plans to adjust its bus scheduling, and the result are a bunch of minor cuts to bus schedules throughout the city. No routes will be scrapped, and the J train will in fact enjoy two additional morning trains. But neighborhoods will see bus wait times inch upward as certain routes are cut. The changes, which you can find right here as a PDF, come across as minor. Some buses will see headways increased from 10 to 12 minutes. Others will see wait times go from five minutes to five minutes and thirty seconds. A few routes in some of the outer boroughs and Staten Island will see off-peak headways increase from 15 minutes to 20. Because of the addition of a few routes and the increase in J service, these changes will actually cost the MTA $300,000 a year, but they are cuts nonetheless. According to the committee documents, the MTA is putting forth this proposal to “ensure that bus and subway schedules accurately match current rider demand and operating conditions…These changes also address the need for running time adjustments to more accurately reflect observed operating conditions.” It all sounds good, but there’s a fundamental problem of supply and demand. When it comes to public transit options, supply often drives demand. If I know a bus runs frequently and regularly, I’m more likely to take it than I otherwise would be. If Transit cuts back bus service so that trips are less frequent, it will make the bus a less attractive transportation alternative and will further drive down demand until they can cut the supply to zero. In a world where public transportation is a public good, these scalebacks are just a part of death by a thousand cuts.